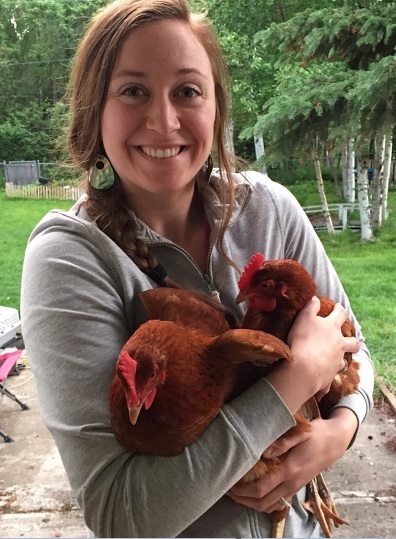 After harvesting my first vegetable garden this fall, I was excited to create a hearty recipe that incorporated as much of my organic produce as possible. 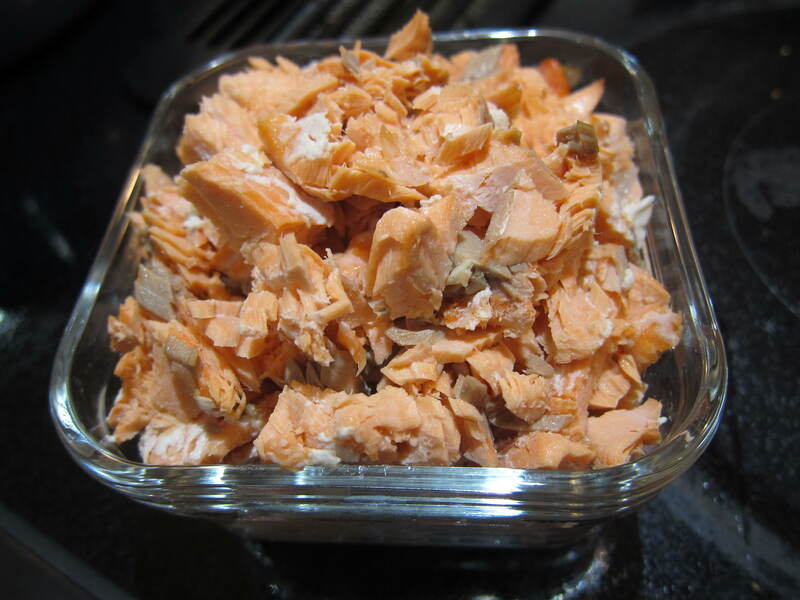 Earlier in the year, our family caught, processed and froze a nice amount of Alaska red salmon from the Russian River/Kenai River confluence in Southcentral Alaska. A hearty seafood chowder seemed like the great dish to combine as many local ingredients as possible. I usually just wing it when I cook, but this time I took notes on how I prepared the chowder (ingredients, quantities, steps) – glad I did, because it turned out great, and now I can share it with you! Here’s the list of ingredients I used. Boil (covered) until the onion & red pepper is very, very soft. 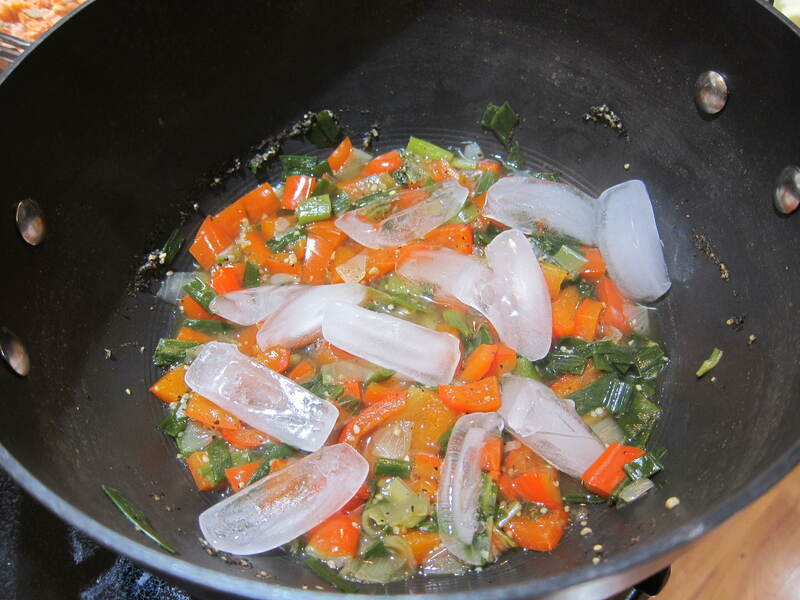 Once it’s all soft, take it off the heat and toss in that handful of ice cubes so it cools faster. 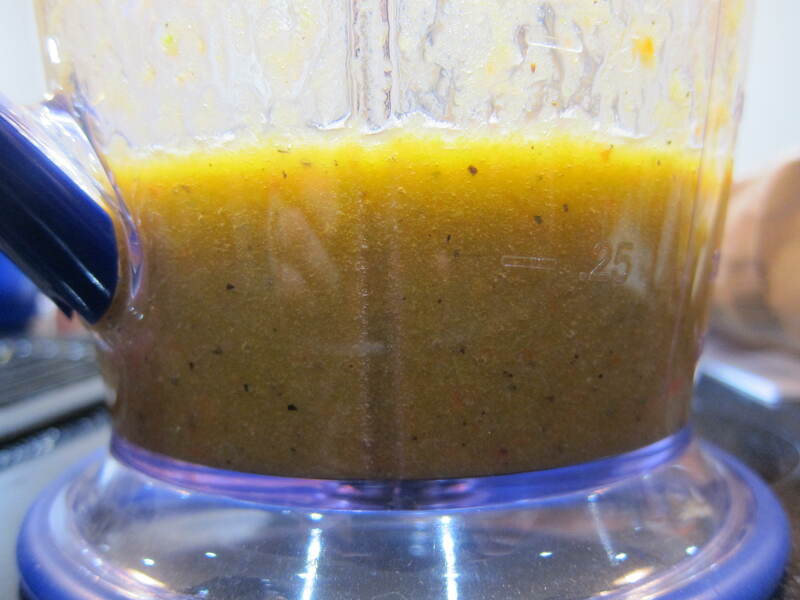 Dump it all into a food processor or a blender, and blend it smooth. This step makes the sweet red pepper flavor permeate well throughout the chowder, plus gives the finished meal that nice light pinkish color that you’d expect in a salmon seafood chowder. After it’s blended smooth, set it aside and move onto Step 2. 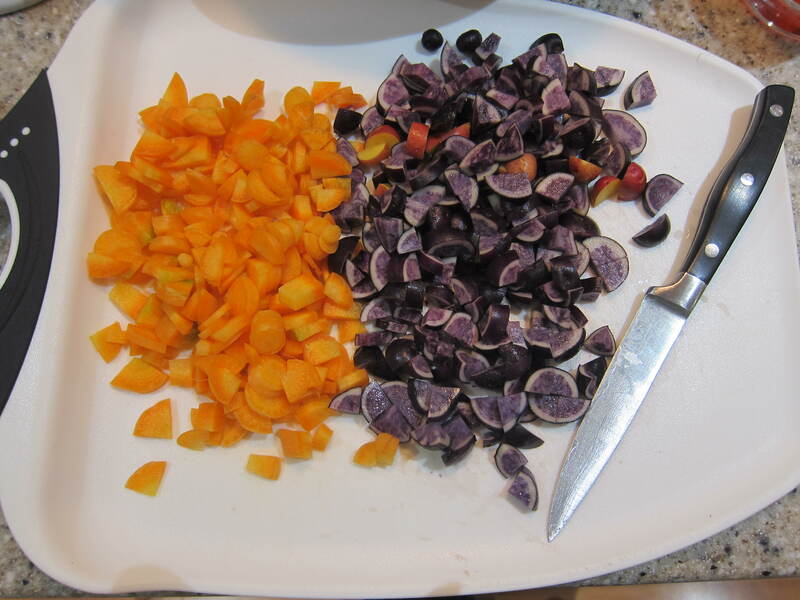 I used blue potatoes, because that’s what I had growing in my garden (variety: “All Blue”). 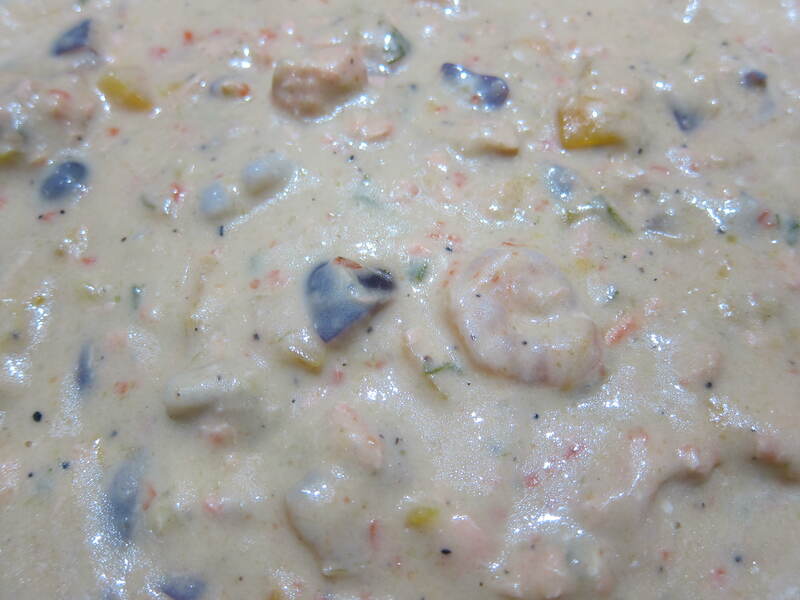 Plus it adds a fun pop of color to the finished chowder. As the vegetables are boiling, you can either take this step by step or multi-task, depending on your cooking comfort level. 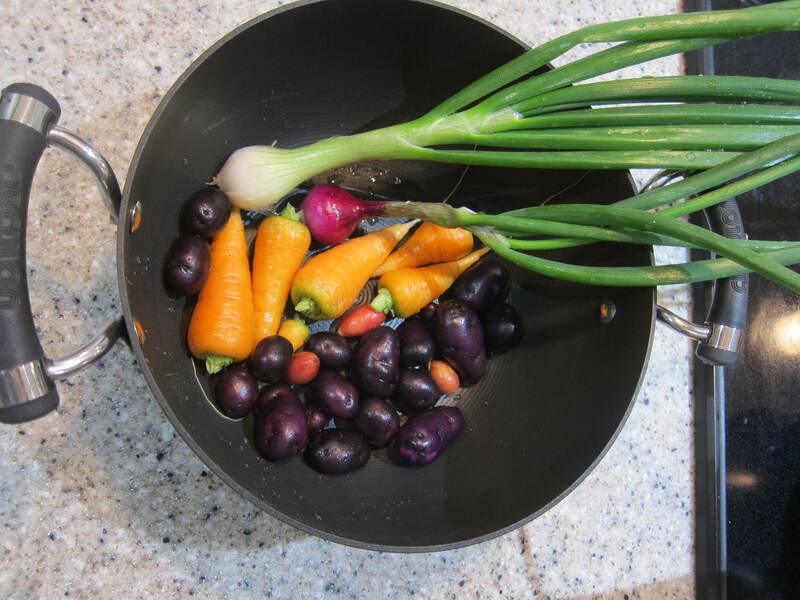 I like to start making my roux (step 3) as soon as I get my main vegetable pot cooking. When you’re making a thicker soup or chowder that needs flour or cheese to give it some texture, you can’t just dump the flour or cheese straight into the vegetable soup pot (step 2) because it won’t mix. You’ll end up with a lumpy mess. A “roux” is basically like making a cheese sauce, or in this case, a thick cream sauce, that combines the flour with some fats so that you can mix everything together well, lump-free. In a small pot, warm up the 4 Tablespoons of butter over low or medium heat. Once the butter is totally melted, add the 4 Tablespoons of flour. Mix it together really well – it should be the texture of thick glue. Right away, add 1 cup of heavy whipping cream, and stir every minute or so. You’ll notice it starting to thicken up after a few minutes. If it’s not getting thicker, turn the heat up a little bit (but you don’t want it boiling or it will burn). Once it stops getting thicker (probably 10-15 minutes after adding the cream), take it off the heat. 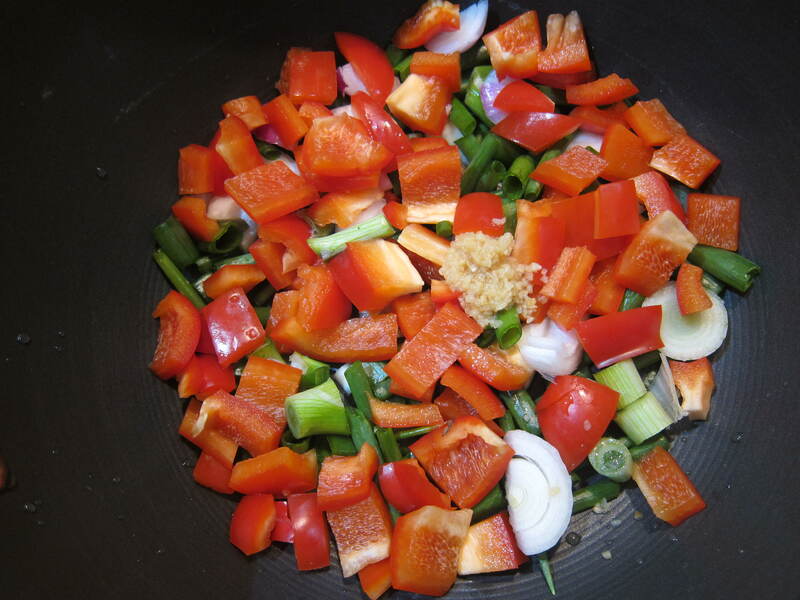 Step 4 – Stir everything together & enjoy! Turn the heat to medium-low, mixing everything together really well. Give it 10 minutes or so, just so the shrimp and salmon can heat up. If you prefer thinner chowders, add more milk until it’s the texture you like. Once it’s all nice & hot, serve & enjoy!